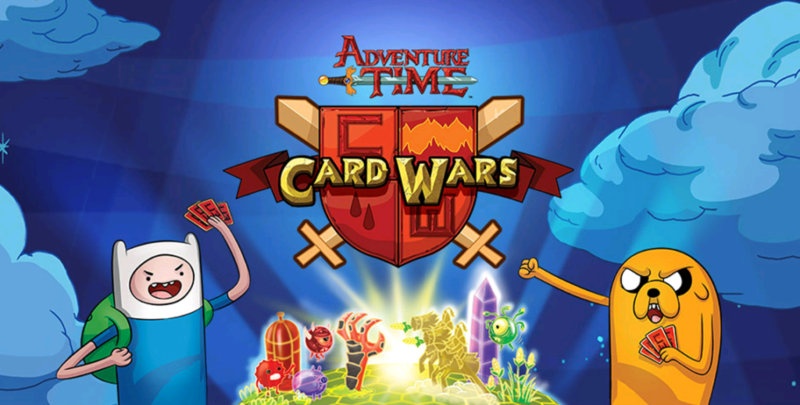 Play the game inspired by the Adventure Time episode, “Card Wars”! Summon creatures and cast spells to battle your way to victory. Card Wars is great! But it needs tweaking with in-app purchases. For a game I (and many others) have paid for, we feel really bummed out when we are forced to wait for in-game cooldown timers to play the actual game we paid for – or prepare to pay more money if we want to continue playing. I think the heart timers should be removed entirely. To make more money, you should introduce Booster Packs available for purchase in-app with real money. This would generate way more sales than gem purchases. It is a CCG afterall, and CCG players are addicted and blow heaps of money on boosters! There are also glitches with the android version that obsessionally stop any of the UI buttons from working – or the screen will ‘darken’ and allow you not to press anything. Other than that, you nearly have a perfect mobile game. Thanks for the feedback Alex. We’re working on some improvements over the coming months that hopefully will be right up your alley. We appreciate the comments. I got a new phone and all the progress and cards and money I had have been deleted. Do you have your old phone still? Please contact our customer support with your UserID and see if they can help transfer. BTW, are you on iOS or Android? I am on android. There is really just a few cards that I would love to get back. The progess loss I could deal with. I don’t have my old phone but I do have the gamer ID from the original game. I also took pictures of my card box and progress in the game if that is relevant. Also I have a folder on my computer that I believe contains the progress from the game, I just could not figure out how to get it to combine with the new game. Thank you for getting back to me! Game is kind of glitchy. No me gusta. I PAID to refill the heart container, which is irritating in itself, played against Dr. Donut on level 30, about to win and get my star, I end my turn, Dr. Donut does the action like he is going to play a card and the game freezes. I tried again, again it froze, I tried a total of 18 times before giving up. This has happened on multiple levels and a few times in Deck Wars. That said I appreciate the game and gave rave review when first I downloaded it. However after the euphoria of a new purchase, I see there is much that can be improved on. While I understand profits are important, I hope they don’t come at the price of a quality product. Hi Aaron, could you do us a favor and please forward this issue to our customer support team? We’d like to work more closely with you to help fix this bug. What is the time frame for the bugs to be fixed? & yes, I have already forwarded the issue to cardwars@d3publisherofamerica.zendesk.com, as of two days ago, & unfortunately, to no avail other than an automated response, has anyone gotten back to me with an answer or at least some sort of idea of how I can qualify for any of the winnings. Isn’t that the whole idea of competing in a tournament?? 😉 Please help! Thanks for the comparison to Hearthstone! We really appreciate the kind words! Danke für den Vergleich zu Hearthstone! Wir schätzen die freundlichen Worte! Stay tuned. We have lots of new features coming soon! I got a new phone and all my progress has been erased. I do not h as very my old phone but I do have my id number . What is the next step? Hi Savion, could you do us a favor and please forward this issue to our customer support team? I think they can help you out with this over there. Thanks for the feedback, SuSpence. We’re working on some improvements over the coming months that hopefully will be right up your alley. We appreciate your input! During “Deck Wars,” I find I am getting a standard trophy return of 10 trophies per match (6 normal + 4 streak). When I look at the ladder above me, there are people with worse records, but higher scores. I’m at 80/4 with 738 pts and just ahead of me is a player at 64/4 with 756 pts. Above him is a player at 41/6 with 807 pts. Are these higher totals due to an error in score-keeping, or is there a mechanic that I am unaware of that they are using to raise their scores? Thanks a lot! I’m enjoying the game. How do we save progress? Upgrade my phone and all my work is gone. I wouldn’t bother buying anything if I can’t save my game. All of our Adventure Time support is being handled via this website. Could you please fill out this form (Select ‘Card Wars’) and we’ll see what we can to do help you? Really enjoy playing this game everyday but I think this game can be even better. My first suggestion is a way that you can save your progress for android users so they don’t have to worry about switching devices. Second one is some sort of trade system where you can trade with everyone who plays. You can put up cards you want to trade and someone offers you something you can either accept it or decline it, or if your looking for a card you can search which type you want by name or by category. It would also be nice to add more cards to the game(1-5) from all categories from weakest to strongest. With adding more cards a few more cards can be added to the crafting section of the game so players can build more cards instead of constantly testing their luck in algebraic chest. I still like the chests though and think if new cards were added, some should go to the cool chest so players are more tempted to use it. The last thing I would like to suggest is players should be able to earn xp from tournaments since when black card tournament arrives, all of your hearts go to it. This way players can still lvl up while playing against other people. It wouldn’t hurt to add loot too. But like I said you guys are doing an awesome job and surprised me and many other people with making this game so amazing based off an episode of everyone’s favorite TV show. I hope to see you guys improve this game even more. Thanks for the feedback Ron. We’re working on some improvements over the coming months that hopefully will be right up your alley. We appreciate the comments! I stopped playing. You didn’t answer my previous question above. What’s the point in playing if you won’t help me out? All of our Adventure Time support is being handled via this website. Another option is to fill out this form (Select ‘Card Wars’) and we’ll see what we can to do help you? Hey guys, I bought gems about 2 hours ago and still haven’t received them yet. Would anyone be able to help me out please? Please make sure you contact our customer support team. They’ll take care of you and get your gems back! When i opened card wars today i suddenly had a level 50 a lot of gems and a lot more cards. my game is back to normal again but i don’t know what happened. It happened again. Of coarse it’s funny the first time you see you randomly have 99999999 gems etc. But i can’t continue my real game and win throphies for deck wars while this happens. You should enable PVP through invitation, soh i could play the game with a friend, random pvp is boring. When do you plan to implement that feature? hey guys and gals…i tried to buy gems twice now and it takes my cash but doesn’t give me gems….im on a iPad mini…any ideas? My son had an iTunes card for his birthday yesterday he tried to buy gems on adventure time card wars , 36 gems for £16.99 he pressed to buy them and confirmed purchase but didn’t receive any gems , but he thought it hadn’t worked so he did process all over again and still didn’t receive any gems , he checked his iTunes balance and all his money has gone purchasing two lots of gems at £16.99 but he hasn’t received any !!! Please reply Asap to this post and refund one payment of £16.99 as only wanted one and send him the gems for his first purchase !!! I believe many would benefit from adding a crafting recipe or a level that drops cough syrup. Since the last up grade I have not been able to log into the game. I have and Ipad 3 and IOS 9 update. What do I need to do? diamond dan, then the game crashes, i reload it then they are gone!!! My name is, The Author if you can do something please help.